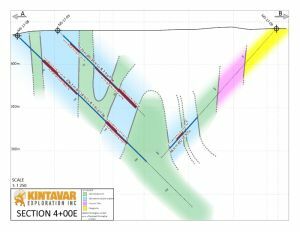 MONTREAL, QUEBEC--(Marketwired - Feb. 27, 2018) - Kintavar Exploration Inc. (the "Corporation" or "Kintavar") (TSX VENTURE:KTR)(FRANKFURT:58V), is pleased to announce the results from the remaining 8 drill holes from the maiden drilling program on the Mitchi project, Sherlock and Watson sector. The assays and the intersected lithologies continue to validate the field observations and interpretation of the folded stratiform copper model and are beginning to provide more detail about the geometry of the folding which is expected to play an important role in the thickness of the mineralized unit. Drill hole MS-17-08 was drilled 50m behind of MS-17-03 that returned grades of 120m @ 0.34% Cu and 2.90 g/t Ag. 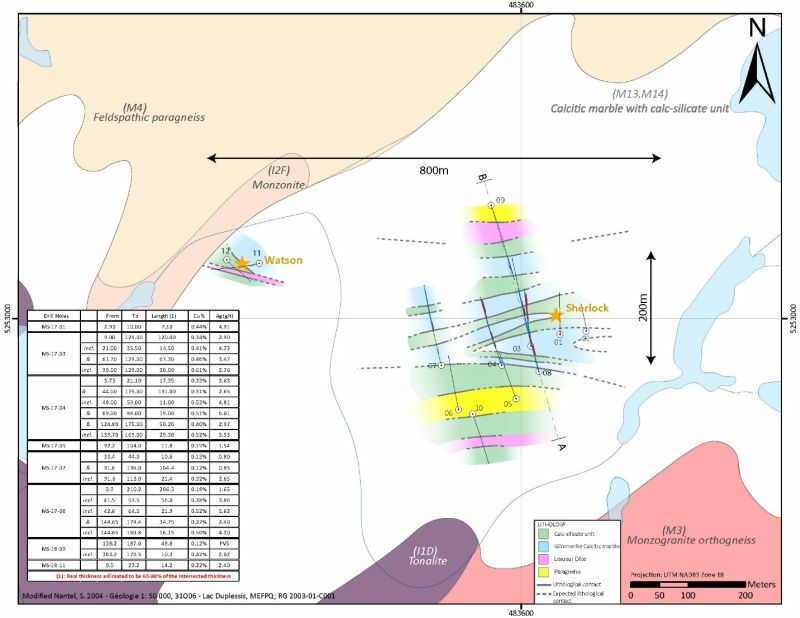 The entire drill hole (285m) intersected the favorable lithologies of the mineralized glimmeritized calcitic marble and the less mineralized calc-silicate unit. The mineralization starts from surface for a total of 206.3m grading 0.18% Cu and 1.65 g/t Ag, including two zones of 21.9m and 16.5m grading 0.52% Cu and 0.50% Cu respectively. Detailed intersection highlights are presented in Table 1 and the cross section 4+00E (see A-B on Figure 2) for drill holes MS-17-03, 08 and MS-18-09 is presented in Figure 1. Drill holes MS-17-05 and MS-18-09 were targeted to define the northern and the southern boundaries of the favorable sedimentary lithological packages while MS-17-07 was testing the extension of the favourable lithologies to the west towards the Watson showing. All three drill holes achieved their objectives and intercepted copper mineralization in the glimmeritized marble units. The objective of drill holes MS-18-11 and MS-18-12 was to better understand the particular structural orientation of the Watson showing and to test for mineralized units. Both objectives were achieved with MS-18-11 intercepting copper mineralization in the marble unit from surface. All the mineralized drill holes suggest that the mineralized sedimentary strata continue at depth and remains open to the East and to the West of the investigated area. In addition, the cross-section interpretation suggests that the maximum thickness of the mineralized strata affected by folding has not been drilled yet. The total extent of the mineralized area that is being currently investigated at Sherlock and Watson based on this drilling program, geophysics and surface work is approximately 800m long. Figure 1: Cross section 4+00E showing drill holes MS-17-03, 08 and MS-18-09. Full size map can be viewed here. "The initial drilling program on the Sherlock and Watson area was a major success. 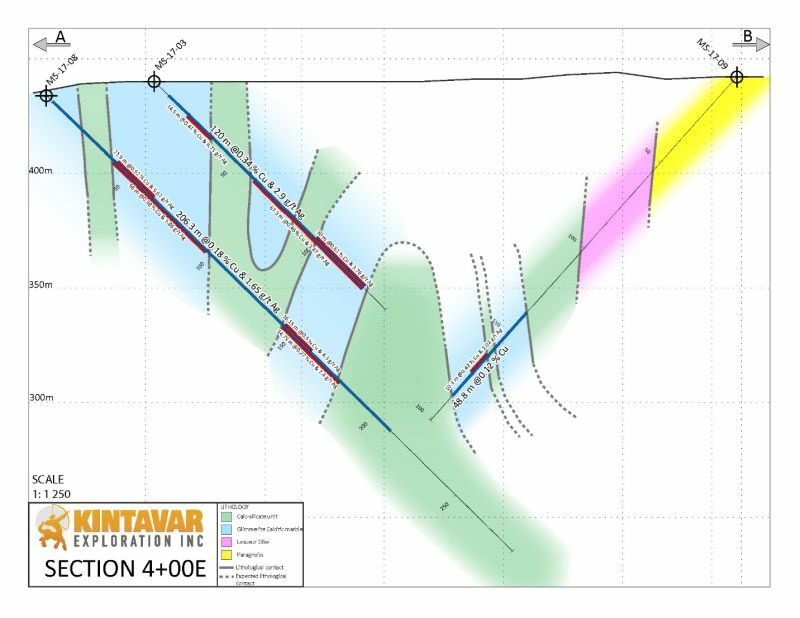 Not only that we were able to intersect over 100m of copper mineralization in four of the twelve drill holes, but we were able to validate at depth the folded stratiform copper model and get a better understanding of the structural geology of the mineralized strata. We are now starting several geophysical programs on both the Sherlock and Nasigon corridors in order to have both areas ready for drilling as early as possible. Stratiform copper deposits are usually known for their continuity and predictability and to date, even with the Grenville deformation we are still seeing that the mineralization is continuous. With the knowledge we gained from this initial drilling program and the information we will get from the ongoing geophysical surveys, this summer's drilling program should be very exciting as we will be focusing on better defining the mineralized areas, extending them and defining them in new areas of the property." comments Kiril Mugerman, President & CEO of Kintavar. Figure 2: Plan view of the winter 2017-2018 drilling program. Full size map can be viewed here. All samples have been sent and prepared (PREP-31) by ALS Global laboratory in Val-d'Or. The pulp was sent to ALS Global laboratory in Vancouver for copper assays (CU-ICP61), silver assays (AG-ICP61) or a multi-elemental analysis by four acid digestion (ME-ICP61) and spectroscopy (ICP-AES/MS). Samples with assays higher than 10,000 ppm Cu were reanalyzed by atomic absorption (CU-OG62) at the ALS Global Vancouver laboratory. Quality controls include systematic addition of blank samples and certified copper standards to each batch of samples sent to the laboratory. The Mitchi property (approx. 28,000 hectares, 100% owned) is located west of the Mitchinamecus reservoir, 100 km north of the town of Mont-Laurier. The property covers an area of more than 280 km2 accessible by a network of logging and gravel roads with a hydro-electric power substation located 14 km to the east. The property is located in the north-western portion of the central metasedimentary belt of the Grenville geological province. Many gold, copper, silver and manganese mineralized showings have been identified to date, with many characteristics suggesting of a sediment-hosted stratiform copper type deposit (SSC) in the Eastern portion of the property and Iron Oxide Copper Gold ore (IOCG) and skarn type deposits in the Western portion. Osisko holds a 2% NSR on 39 claims of the southern portion of the Mitchi property, outside of the sedimentary basin. This news release contains statements that may constitute "forward-looking information" or "forward looking statements" within the meaning of applicable Canadian securities legislation. Forward-looking information and statements may include, among others, statements regarding future plans, costs, objectives or performance of the Corporation, or the assumptions underlying any of the foregoing. In this news release, words such as "may", "would", "could", "will", "likely", "believe", "expect", "anticipate", "intend", "plan", "estimate" "target" and similar words and the negative form thereof are used to identify forward-looking statements. Forward-looking statements should not be read as guarantees of future performance or results, and will not necessarily be accurate indications of whether, or the times at or by which, such future performance will be achieved. No assurance can be given that any events anticipated by the forward-looking information will transpire or occur, including additional closings of the private placement referred to above, or if any of them do so, what benefits the Corporation will derive. Forward-looking statements and information are based on information available at the time and/or management's good-faith belief with respect to future events and are subject to known or unknown risks, uncertainties, assumptions and other unpredictable factors, many of which are beyond the Corporation's control. These risks, uncertainties and assumptions include, but are not limited to, those described under "Risk Factors" in the Corporation's management's discussion and analysis for the nine months ended September 30, 2017, which is available on SEDAR at www.sedar.com; they could cause actual events or results to differ materially from those projected in any forward-looking statements. The Corporation does not intend, nor does the Corporation undertake any obligation, to update or revise any forward-looking information or statements contained in this news release to reflect subsequent information, events or circumstances or otherwise, except if required by applicable laws. Figure 1: Cross section 4+00E showing drill holes MS-17-03, 08 and MS-18-09. Figure 2: Plan view of the winter 2017-2018 drilling program.